Pool Shark H2O came to us to develop their mobile app for inspecting commercial swimming pools. Those inspections are important —given that 80% of the 360,000 commercial pools in the US do not meet health code requirements. Based in Bennington, Vermont the company needed an iPhone app to accurately log pool inspection and maintenance — both for the owners and to meet the requirements of government-mandated inspections. Enabling inspectors to do off-line recording — and with a patented mechanism for geocoding— the app ensures that the inspector is on-site when the work is done as well as time stamping when it was done. 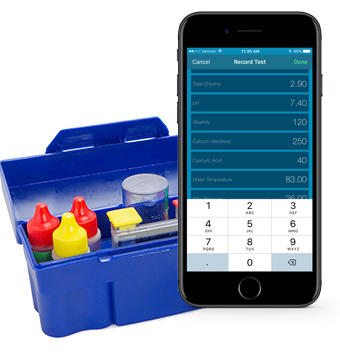 With the water analysis calculations built in, the app tells you exactly which chemicals you need to put into the pool — and is simple enough that anyone can use it with minimal training. Since launching the app, Pool Shark H2O founder Scott Trafton, has doubled the number of clients and has expanded to 19 states — and is growing. “Green Mountain Software has been great. The initial development was a six-week process and they were very easy to work with.” Scott Trafton, President, PoolShark H20 inc.